There are caveats with this sort of application, of course. For starters, it's not official (obviously) and so is cleverly reverse engineering what it can of Google's internal Drive and Photos APIs, with the risk that any any point Google could subtly change something and potentially break GDrive.NET - hopefully temporarily, but possibly permanently. It all works (within its limitations) now, but just be aware of the (un)official status. Secondly, GDrive.NET is trying to be quite ambitious in terms of handling large numbers of files on Gigabytes of Google Drive and with (often) tens of thousands of photos. Now, it does pretty well with such large data sets and you usually only get to see them when you scroll down, and down, and down, etc. in the various views. But it does fall over sometimes, with seemingly random crashes and the application then needs relaunching. 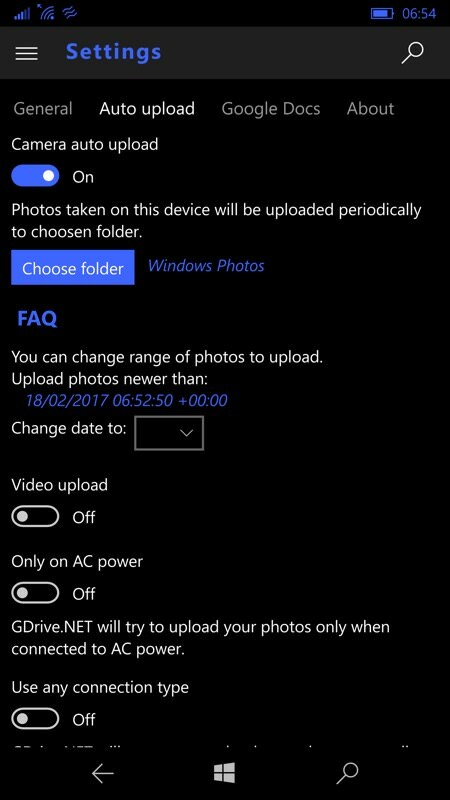 But don't despair - the upside if that you have pretty full on access to all your Google Drive/Photos content - on a Windows 10 Mobile smartphone. And we didn't think that would happen anytime soon. 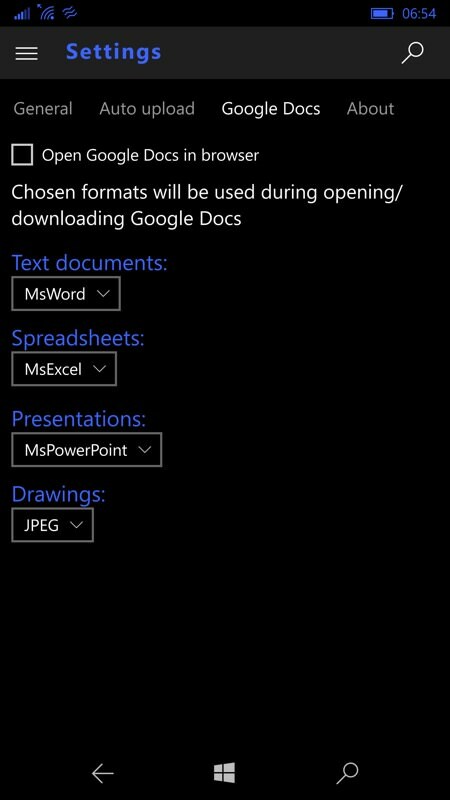 There are some basic limitations, of course - you can't edit Google documents or photos in-place - instead they have to be (auto-)downloaded and (auto-)saved/converted - but this all happens pretty seamlessly, with (for example) Google Sheet documents being opened automatically in Microsoft Excel on the phone. 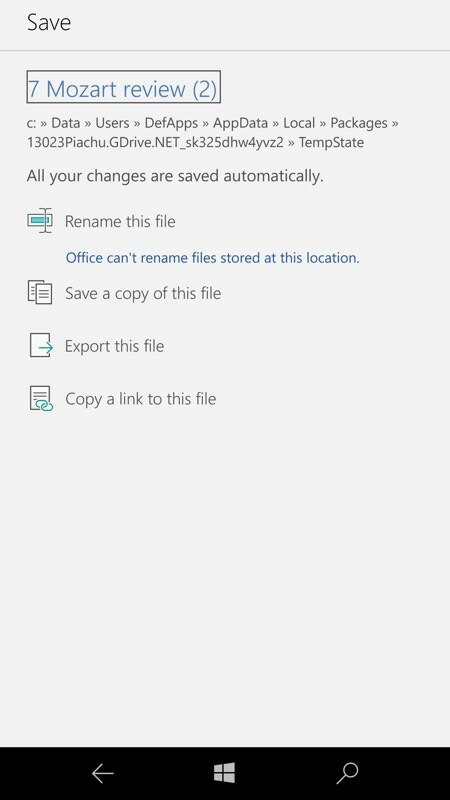 And there's plenty of flexibility, right across the various document types, as you'll see in the settings below - you can essentially set up GDrive.NET as you want it. One good question might be why you'd want all this Google-hosted content on Windows in the first place? The thing about Google is that it is ubiquitous and used so much on other mobile platforms and in web browsers the world over that there's a good chance that all of us have at least some documents or media in Google's cloud. Especially so if you also have an Android (secondary) phone or tablet, or if you tend to live in Chrome on the desktop. 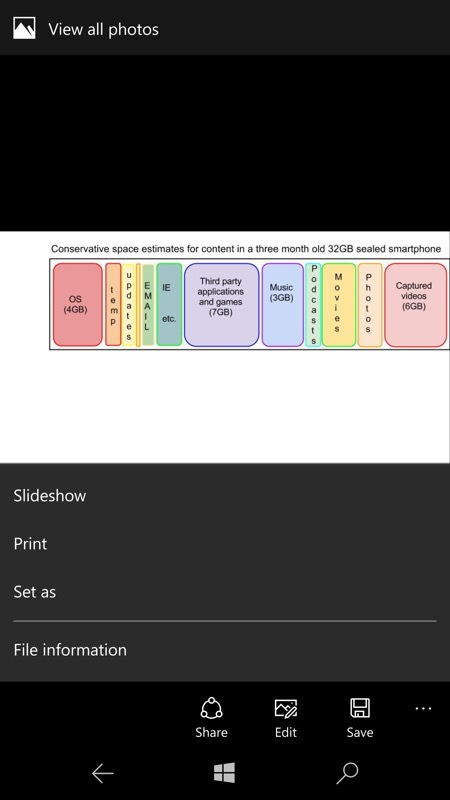 In each case, even though (like me) you have far more content in Microsoft's OneDrive (helped by the typical 1TB that comes with Office 365! ), you'll have some Google content too - and this is the best way so far to access it on Windows 10 (Mobile). 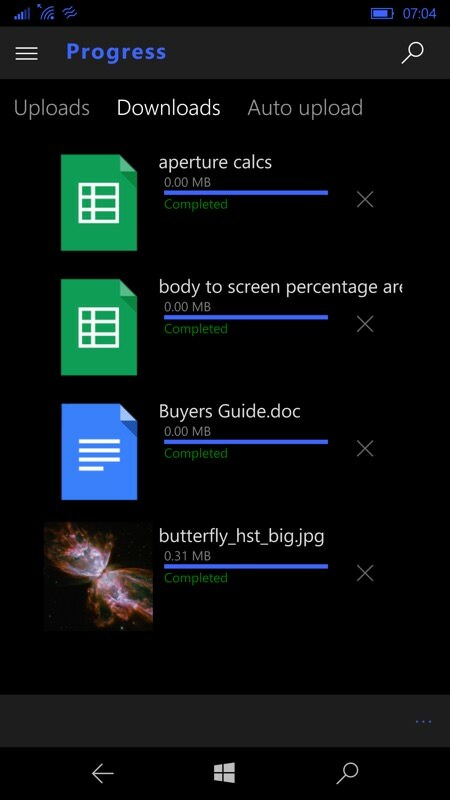 GDrive.NET is a full Windows 10 UWP app: style, fonts, hamburger menu, controls, layout-adaptable, Continuum-compatible, the works. Notable, on the menu, is 'Pictures' as well as 'Google Photos' and it's not entirely clear as to the distinction - they both appear to have the same content! (right) There's a choice of a grid layout (as here) and a linear view, also with thumbnails. 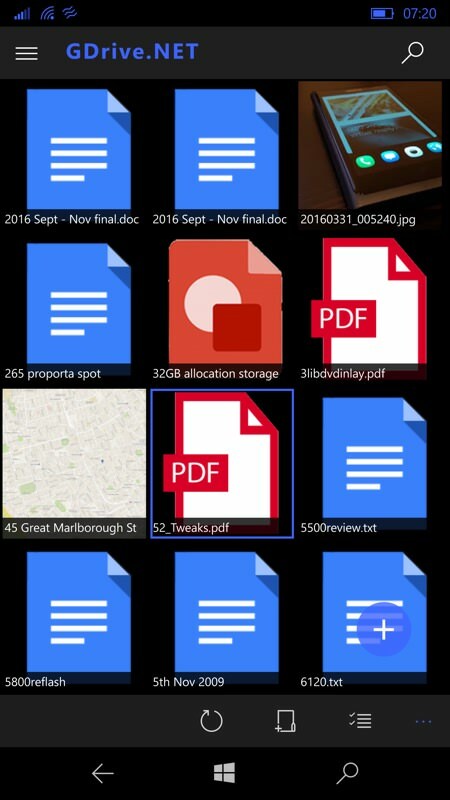 Tapping any file in your Google Drive opens it - and by 'opens' I mean downloads it in the appropriate format for your Windows 10 device/phone. 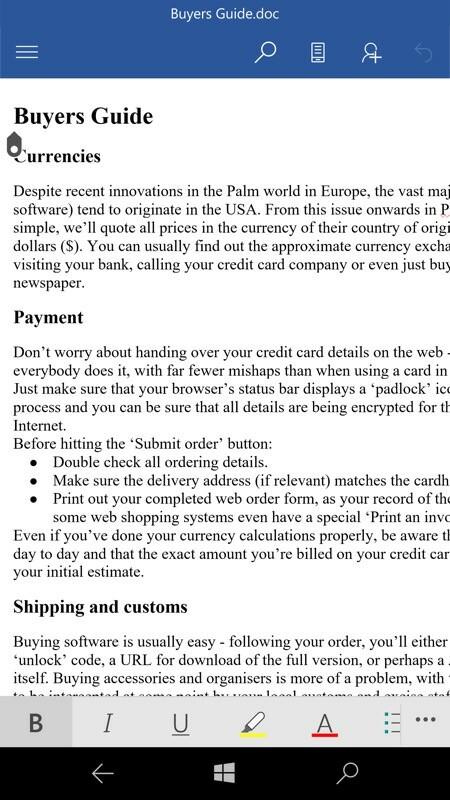 By default, as here, Google Documents (i.e. words) are auto-converted and opened in Microsoft Word, ready for editing. It's all handled seamlessly, even if the edited document is then on the phone rather than being in-place on the Google servers. Still, it's miles better than not having access at all, right? 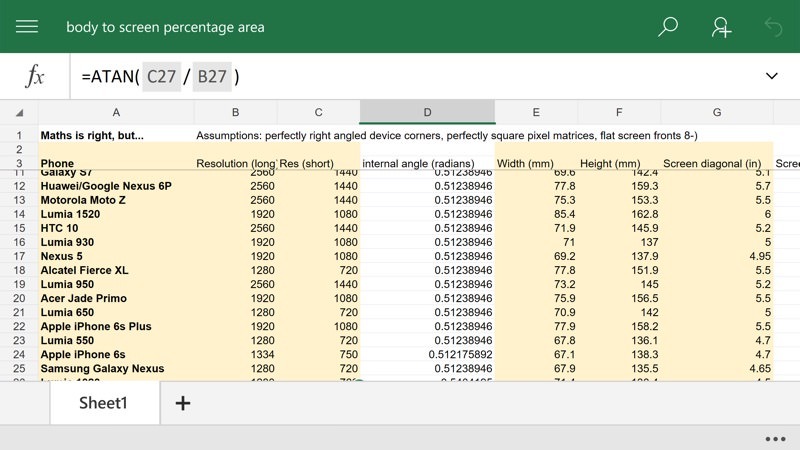 Here's another example, tapping on a Google Sheet opens it on the phone in Microsoft Excel. 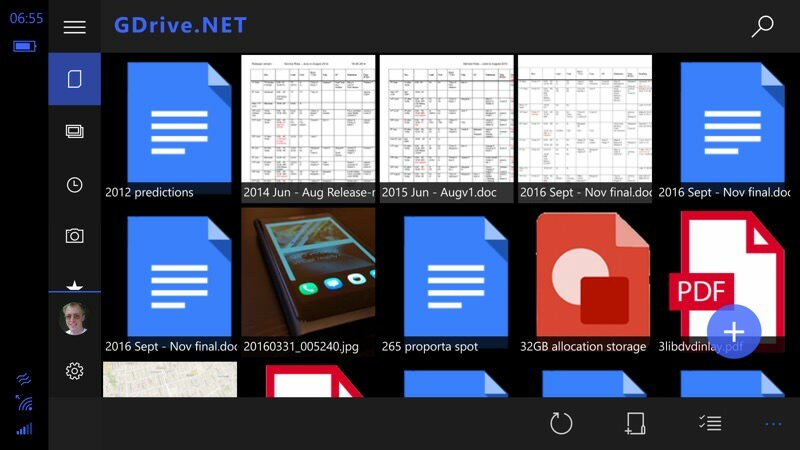 Again, you're not editing the file on the server - that's in Google's own Sheet format - but a local file on the phone itself, from GDrive.NET's download folder. In terms of gaining access, editing and then doing something with the result though - it works. 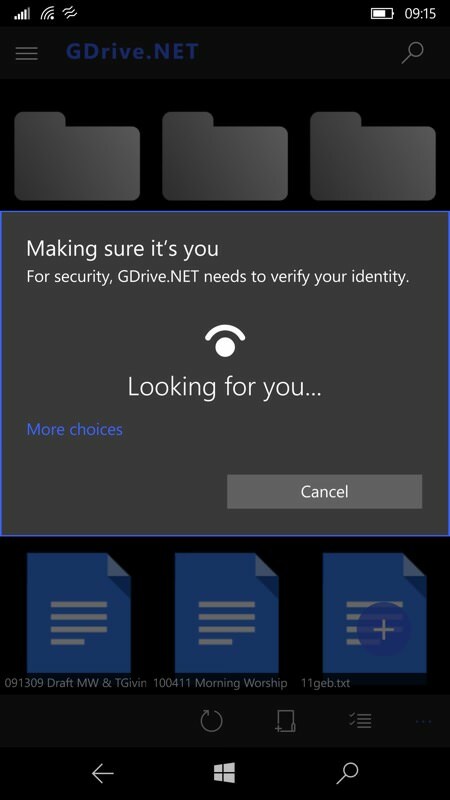 GDrive.NET is fully aware of Windows Hello too, so it can accept an iris scan, a fingerprint scan or a PIN to protect access to your Google Drive session. This works, though can get a bit confused - after failing an iris scan on my Lumia 950, it then point blank refused to even try iris scanning again, ever after a phone restart. 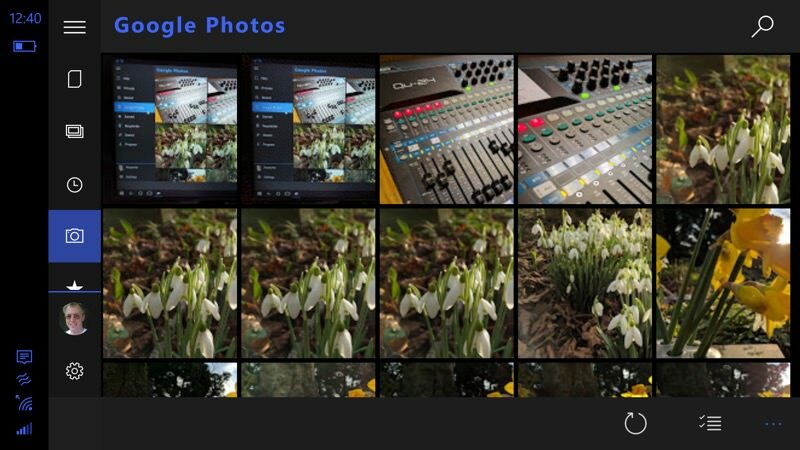 Ah well, at least PIN entry always works - or you can opt not to have access control at all; (right) tapping on images results initially in a preview, as here, with properties available on the Google server. 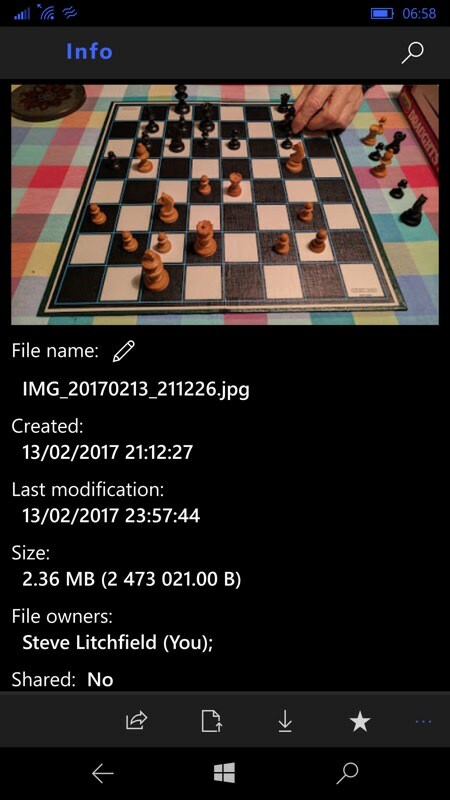 You can then download the photo directly to a folder of your choice or opt to 'Open' it, which still involves a download, but internally within GDrive.Net's sandbox, perhaps for editing and then exporting. 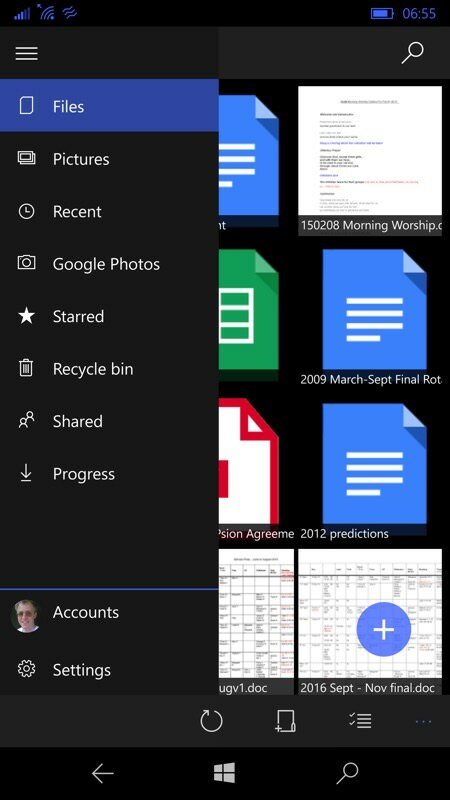 Here's the main GDrive.NET view of your Google Drive again, but this time in landscape mode - and the same layout is used for Continuum (as you'll see later) and when running GDrive.NET on a tablet or laptop running Windows 10 Desktop. 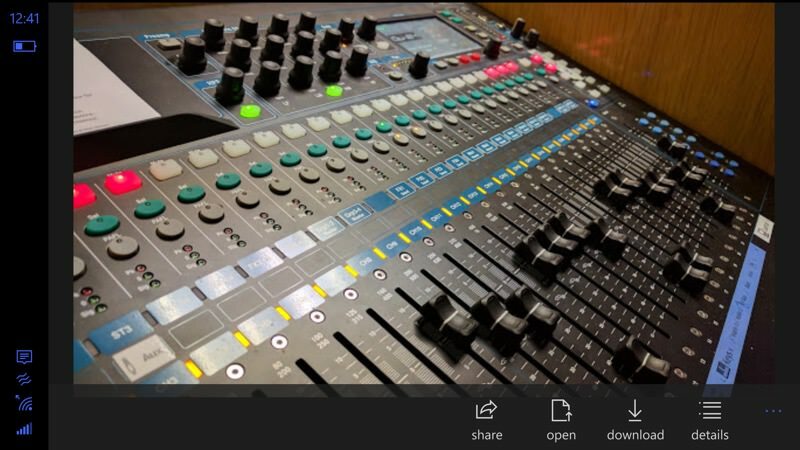 There's a wealth of settings to fiddle with in GDrive.NET, including the auto-upload of captured media (photos and videos), should you want your content on Google's servers as well as Microsoft's. It never hurts to have extra backups, eh? (right) Another example of the flexibility on offer - here even Google Drawings (i.e. vector art) are brought down, albeit as bitmaps. The lesson is that everything can be accessed somehow. Which, again, is worlds better than not at all, which is where we were before GDrive.NET appeared. All very worthwhile - it's £1.50 or thereabouts to get rid of the ads and enable all the settings, but this is a tiny price to pay for access to Google content on Windows 10, I think. Moreover, the developer has been moving apace over the last 12 months, so I think we can look forward to further improvements and functionality in the near future.